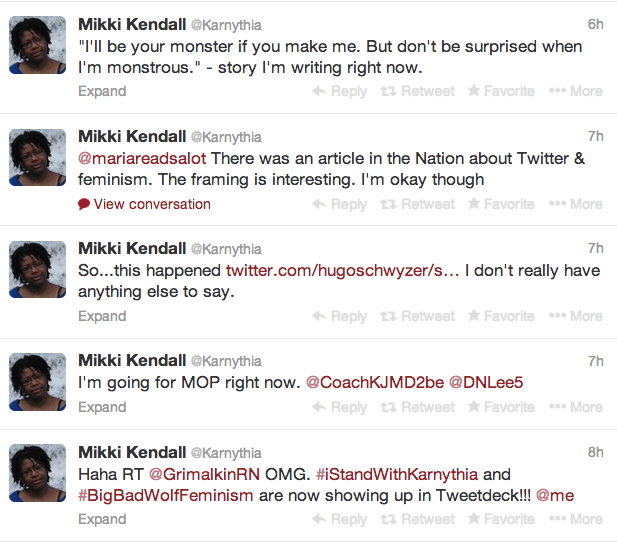 Well it looks like there's a new Twitter tag in town - #IStandWithKarnythia - because finally, one liberal media outlet, The Nation has decided that maybe, just maybe, professional hater Mikki Kendall has issues. Mikki Kendall is unmoved by complaints about the repressive climate online. An Army veteran, graduate student and married mother of two in Chicago, Kendall is both famous and feared in Internet feminist circles. Mother Jones declared her one of the “13 Badass Women of 2013”—along with Wendy Davis and Malala Yousafzai—for her creation of the #solidarityisforwhitewomen hashtag. But as Kendall well knows, many consider her a bully, though few want to say so out loud. “I kind of have a reputation for being mean,” she says. On the phone, Kendall isn’t mean. She seems warm and engaging, but also obsessed—she talks at length about slights made in the comment threads of blogs more than five years ago. As she sees it, feminist elites have been snubbing women with less power for years, and now that their power is being challenged, they’re crying foul. Their complaints, she argues, are yet another assertion of privilege, since they’re unmindful of how much more flak Kendall and her friends take. Look at her go - bullies always have a justification for why they are bullies. And notice how much absolute unshakeable contempt she has for white women - suggesting that white feminists are so completely stupid and ignorant that our frame of reference for racism is a recent movie, "The Help." She just can't hide how much she despises white women even for a moment. The only power Kendall cares about is her own - attacking feminists has made a nice career for Camille Paglia and Christina Hoff Somers and Katie Roiphe - why shouldn't Kendall try for some of that anti-feminist money, especially when she has the extra angle of attacking white feminists? I would not be at all surprised if Kendall eventually parlays her obsession into a gig at a right-wing think tank. I was disappointed - although not surprised - that the article doesn't mention Kendall's comrade in bigotry, the Nation's own Aura Bogado. Kendall isn't only a bully though. She also wrote a piece for Salon in which she implied that a doctor tried to kill her out of anti-abortion fervor on the basis of zero evidence. She's completely unethical and utterly unashamed of her lack of ethics. And for the most part has gotten away with it.